Raspberry Mint Apple Cider Tonic - A recipe from Savor California, the online showcase for extraordinary gourmet foods and beverages from California. Combine Mint Syrup and Apple Cider Vinegar to create concentrate. To serve, pour ¼ cup concentrate into glass and dilute with ¾ cup water or sparkling water. 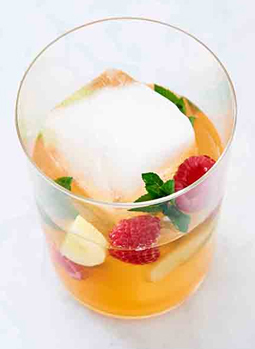 Garnish with raspberries, cucumber slices and mint.